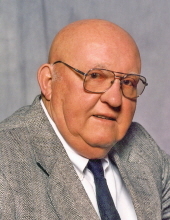 Robert ‘Bob’ Pepper, of Boone and the Westhaven Community, died at the Boone County Hospital on his birthday September 1, 2018, at the age of 92. Funeral Services will be Wednesday, September 5, 2018 at 10:30 a.m., at the First Baptist Church in Boone, with Rev. Janell Bloem officiating. Burial will be in the Boone Memorial Gardens with Military Honors conducted by the Boone Veterans Council. Robert Duane Pepper, was born on September 1, 1926 in Des Moines, Iowa, the son of James and Della (McVicker) Pepper. On April 16, 1949, Bob married Wanda Carroll in Omaha, Nebraska. In 1952, Bob began working as a brakeman for the Ft. Dodge, Des Moines & Southern Railroad and later as an engineer for the Chicago & Northwestern Railroad, retiring in 1988. Bob served with the United States Army during the Korean War, and was awarded a Purple Heart. Bob was a faithful and devoted husband and caregiver to his wife, Wanda. He enjoyed traveling, was an avid Cubs fan, enjoyed playing cards, tinkering in his garage, pontooning on Lake Rathbun, and loved spending time with his family and grandchildren. He is preceded in death by his parents; his wife Wanda; two sons Jay and Michael Pepper; a grandson Sydney Pepper; and two sisters Ruth Wirth and Helen Lorentzen. Bob is survived by two sons Pat Pepper and wife Patsy, of Warner Robins, Georgia; Tim Pepper of Pensacola, Florida; two daughters Carol Majors and husband David, of Windham, Maine; Jean Mallicoat and husband Trent, of Ogden, Iowa; 10 grandchildren; seven great grandchildren; numerous nieces and nephews. Friends may call at the Schroeder-Reimers Chapel on Tuesday, from 3 until 7 p.m. where the family will be present from 5 until 7 p.m. On Wednesday, friends may call at the First Baptist Church from 9:30 a.m. until service time. In memory of Bob, memorials may be directed to the family for a memorial to be established at a later date. To send flowers or a remembrance gift to the family of Robert "Bob" Pepper, please visit our Tribute Store. "Email Address" would like to share the life celebration of Robert "Bob" Pepper. Click on the "link" to go to share a favorite memory or leave a condolence message for the family.